If you’re interested in working from home, chances are relatively high that you participate in a remote job interview at some point. With more than 300 million users, Skype has become one of the most popular platforms for conducting video conferences. It’s wise to get Skype-savvy! There’s also a lot more to consider for a remote job interview than a traditional in-person one. 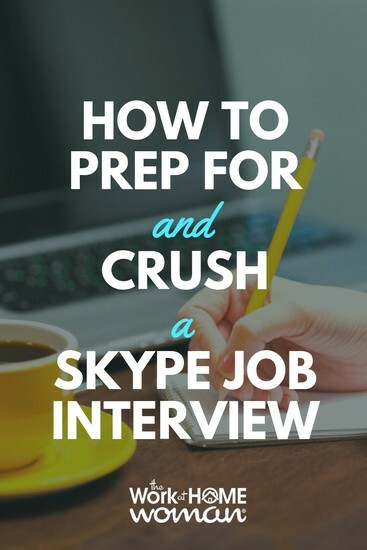 If you’re preparing for your first Skype interview, run down this checklist to ensure a glitch-free call that will dazzle your future employer. The backdrop of your interview matters. If you’re interviewing from a cluttered home office, you’re going to make a negative impression before you even open your mouth to introduce yourself. Keep the background neutral and clean. Avoid sitting right in front of a window or in any lighting that will affect the camera clarity. If you need to, set up your computer in a different room that’s quiet and free of outside noises or other distractions. If your dog likes to bark at people passing by, ask a family member, friend, or neighbor to walk your pet during the scheduled call. If you have children, ask a family member to take them out for an hour. Hire a babysitter if you have to! Turn off your cell phone, and make sure everyone knows you’re unavailable during the hour of your scheduled call. Just because you’ll likely be working this job in a sweatshirt doesn’t mean you should interview in one. You don’t need to dress to the nines, but keep it professional as you would at an in-person job interview. While it might be tempting to wear pajama bottoms since Skype interviews are typically “talking head” only, it’s not a good idea. For one thing, if your interviewer inadvertently gets a glimpse of your Hello Kitty PJs, you can kiss the job goodbye. But dressing well from head to toe will also help you feel more confident and professional. Keep your Skype username professional like you would with your work email address. It might be time to change your “crazycatlady84” handle from 2007 to something more appropriate. Your first and last name will suffice. In some cases, the name of your business might also fit. You don’t want to waste the first 10 minutes of your interview figuring out how to turn on your headset’s microphone. Practice Skype-calling with a friend or family member the day before so you can test the camera, lighting, and sound. This helps you iron out technical difficulties ahead of time. Aside from trying to stay relaxed, keep these specific tips in mind to make a positive impression during your Skype call. This should go without saying—your interviewer should have your full attention. Yet in the age when we’re constantly distracted by our phone notifications, it’s all too tempting to get distracted by a new email or Facebook notification coming in. Remove temptation by closing your internet browser and email for the duration of the interview. It takes some getting used to, but try to look at the camera on your computer frequently during the call to create the illusion of “eye contact” with your interviewer. This simple trick will make you seem more confident and competent. It can feel weird talking to a screen if you’re not used to it, but try to act naturally. Don’t smile mechanically but do so when it feels natural. Take Advantage of Being Remote! Although there’s a lot to think about when participating in a Skype interview, there are some advantages too! Do your research on the company and role you’re applying for and take notes. Then you can keep notes either up on the screen or on the table next to you during the interview. Having that information at your fingertips can be useful should your interview ask a certain question; you can knock their socks off with your prepared response! Just use the notes as discreetly as possible. Even though the call may be over, there are still actions you should take to increase your chances of getting hired after the fact. A few hours after your Skype call, email your prospective employer to thank them for their time. This isn’t optional. According to TopResume.com, 20% of interviewers will nix a candidate if they don’t receive a post-interview thank-you email! Keep it short and sweet. Two or three well-thought-out sentences is plenty. A few days of silence doesn’t necessarily mean your interviewer has chosen someone else. People often get busy, especially those who run small businesses and are just starting to outsource responsibilities. Don’t be afraid to follow up a couple of times in the following weeks. Another way to stay on their radar is to follow them on their company social media channels. Engage with their content by commenting and sharing. If your first call doesn’t go as smoothly as hoped, remember that they can take a little practice and it’s all good experience for future calls. Even if you don’t end up getting the job, keep those leads warm. Sometimes the person they end up hiring doesn’t work out, or they might be ready to hire again a few months down the road. Don’t be afraid to pop into their inbox every few months and offer to connect. Job interviews are nerve-racking enough as it is without worrying about the technical aspects of a video call. But if you follow these best practices, you can master Skype calls and even use them to your advantage. Don’t let a little camera-shyness stop you from being the work-at-home woman you long to be! Corrie Alexander is a content creator and logistics nerd from Toronto, Ontario. Her climb up the corporate ladder cultivated her interest in the topic of career development, a passion rivaled only by her love of exercise and strong coffee. Visit her website, thefitcareerist.com. I think that dressing up for the role is very important. I think that if you are dressed properly, you are one step ahead! Indeed! Not only do you look polished, but when you look good, you feel good and that will come across in your interview. Prepare few questions in advance. Normally, you’ll be asked “do you have any question”. That’s a great suggestion, Destria. Having questions shows your interest in the company and position. Great point! Almost every interviewer – in person or otherwise – will ask the question “So, do you have any questions for me?” If you say no, it sort of makes it seem like you haven’t given too much thought to the position. Plus, I think a lot of eager job hunters are so focused on landing the gig that maybe they don’t give as much thought as they should to whether or not the job is the right fit for them. I always feel that job interviews are as much a chance for you to interview your employer as it is for them to interview you! That’s an advertisement for a membership site — which I’ve never heard of before. I personally wouldn’t join it.